We, in India, have grown up on a steady diet of movies in which identical twins get separated at birth due to unforeseen circumstances, acts of god, strange twists of fate, odd behaviour of birth attendants, ... what have you. They are usually taken in by people as different from each other as possible, and grow up not knowing their reality. Hilarity/ confusion often arises out of situations that arise due to mistaken identity. Then we have the sudden and inexplicable bursting into song and dance, with everyone around joining in - whatever the mood of the song. And the hero who is the 'good son' of an underworld don! So many components to a formula that can be put together arbitrarily, and have perfect nonsensical sense! A woman dies while giving birth to identical twin girls. For reasons best known to herself, the midwife deposits one of them at an orphanage and then puts the other in a reed basket which she sets afloat on the river, which is then picked up by a movie producer. The girls grow up in disparate circumstances, and one day, both of them separately meet a 'boy'. We all know how it might go on from here - though with a significant difference. 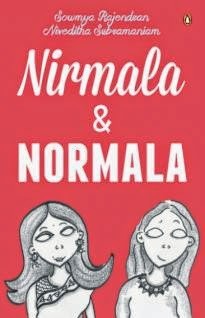 For Nirmala will be Nirmala, the movie heroine, and Normala will be Normala, the 'normal' one. Though the 'normal' is debatable - there can be many shades of normal! Personally, I liked Normala more - she certainly seemed a more believable character, a 'real' person, than Nirmala, who was the plastic sort of person, as if she were merely following a script. That, I suppose, is the success of the writers. The graphic novel format made the narrative very visual, which, again, was a masterstroke - almost as if a movie were unfolding in front of you - fitting in with being a spoof of movies, be it from Bollywood, Tollywood, Kollywood, or any other sort of wood. A couple of grouses, though. One, is that the narrative lacked a certain depth that would have made it more interesting - something was missing. Two, is that the authors have missed the opportunity of making it funnier by having the two protagonists' paths cross. After all, they are identical twins with a difference only in the placement of moles - a classic trope of this genre. That way, the movie spoof would have been more complete. As it is, I felt a wee bit cheated! Not paisa vasool enough! This book would certainly be a hit among the intended age group, if the lengths I had to go to take it off my teen and a visiting friend are any indicator - they were glued to it, giggling away as they read! Image courtesy Penguin Books India. Disclaimer: I received a copy of this book from the publisher for review. The opinions are all mine.